Please call owner HUMBERTO at 305-304-4588. Boat is in Tavernier, Florida. 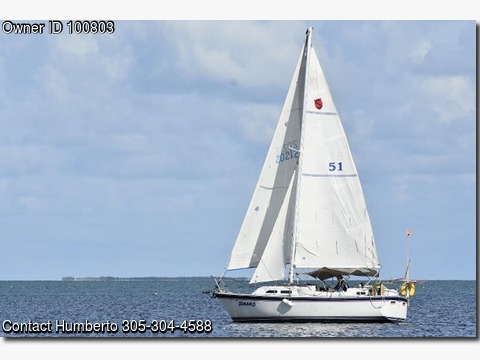 COME GET IT QUICK--NEGOTIABLE Family was here for holidays--got my sailing done, boat can be yours now. ROOMY CRUISER with forward and aft cabins, center cockpit, and center board for shallow waters. This 1979 O'Day 32' has a roomy forward cabin with V-berth, spacious saloon with dinette/chart-table and head sink, toilet, shower on the port side, and settee/single berth and galley on the starboard side. Lots of storage under the settee cushions, as well as above and behind the back rests. The galley has a brand new propane stove, ice box and sink with pressurized fresh water. Access to engine room below galley sink also from aft cabin. The center cockpit sits 6 all around plus room for captain. There are 4 folding-type seats for the cockpit seating. Lots of storage in the lazarettes. Aft cabin with comfortable double bed, hanging locker, sink and toilet. Both toilets are portable type, there is no holding tank and complicated plumbing. Access to engine room from aft cabin. Sails Genoa jib, self-tacking staysail and main with 2 reef points. I do not have a halyard for the spinnaker at the moment. Engine 2006 Yanmar Marine Diesel 3GM30F, fresh-water cooled in great condition, with approximately 1000 hrs. Very economical, less than a gallon per hour. Lots of room in engine compartment and dual access allows for additional equipment to be installed. Batteries one very good, one brand new in December 2015 Rigging dinghy davits, standing rigging and running rigging in great condition. The Campbell Sailer propeller is designed and manufactured to be one of the most efficient fixed blade sailboat propellers on the market today. Unique and innovative, it has been granted a Canadian patent. After nearly thirty years of production and refinement, the Campbell Sailer has proven, against other leading fixed blade designs, to be a superior choice for sailboat owners. Helm Edson pedestal with brand new June 2015 Raymarine Autopilot works fantastic, Garmin 498 GPS, Hawkeye depth sounder. Dinghy WM 9' inflatable, soft bottom, rolls into a case, with locking oars, 2HP Yamaha outboard, anchor, pump, etc. Stow aboard, or hang from davits. Other equipment ship's bell, all CG flares, fire extinguisher, etc, MOB pole, 2 horseshoe life savers, wind scoop, etc.